You are in Home > Blog > Food & Drinks > How Thirsty is Your Food? 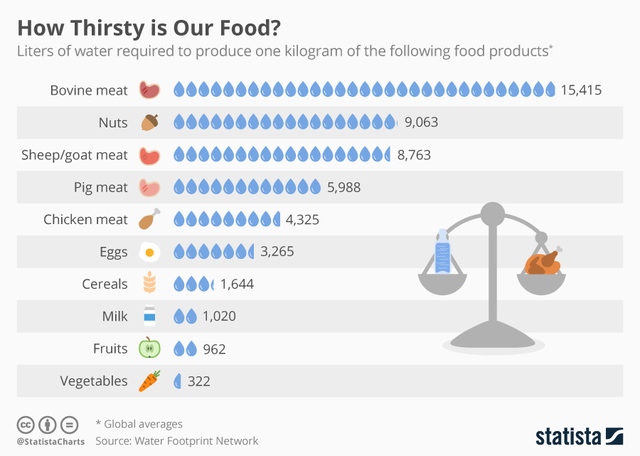 Here’s an interesting chart from Statista that looks at how much water it takes to produce certain foods. The simple infographic looks at the global average amount of water it takes to produce a range of different ingredients, from meat to vegetables. Those in the know will not be surprised to see that bovine meat comes out on top, taking around 15,000 litres to produce just one kilogram. That figure is actually higher than the figure by the UN which is around 9,000 litres, but whichever one you consider, they’re both massive amounts. What some people might find surprising is that nuts, yes nuts, come in second on the list. They’re listed at just over 9,000 litres needed for one kilogram which is why those almond milks, if you can really call them milk, are actually not so environmentally friendly. Normal milk actually rocks in at around 1,000 litres for one kilogram.